The new centre should be attractive. After some brainstorming it was decided that the new info-centre will be constructed, making use of old sea containers. This is a low-cost approach of creating a lot of space. On the outside it will look like the container, on the inside there will be beautiful spaces for a bookshop and a comfortable info-centre. 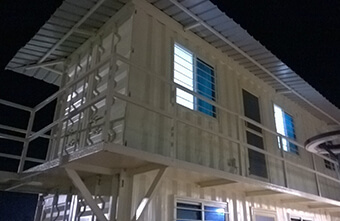 With these containers it is possible to make a suitable lay-out design fitting our purposes. In this case we use two 20 ft containers and two 40 ft containers. With them we have the needed space. We put the bigger containers on the smaller ones, thus creating two stories and lots of space. 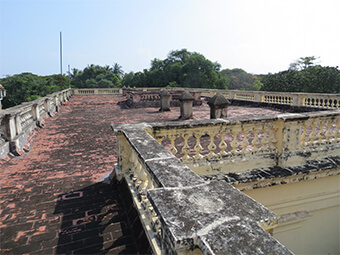 The history of the Adyar estate is very distinct. Most Theosophists are familiar with parts of it. Among other things they know of the talks with the Masters on the roof of Headquarters Building, or of the famous tea cup Mme Blavatskyby materialized in Simla, which belongs to the museum collection, while many visitors also come attracted by the famous Banyan Tree. It would be good if we were completely open to the public for all these treasures, 365 days per year. How can this be organized? 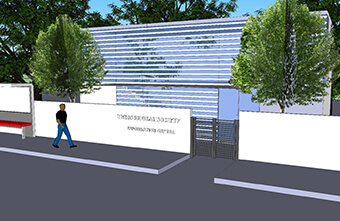 Headquarters Building will contain a museum which is open to the public. 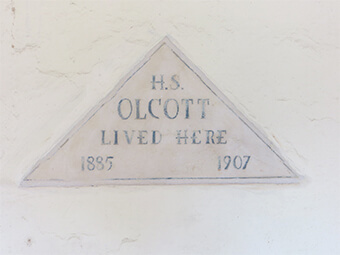 Visitors can go up to the roof and look at the places where Blavatsky, Olcott, Annie Besant but also Krishnamurti used to live. The current museum in Headquarters Building will be fully reorganized so it can have more space to exhibit the artifacts. The current exhibition in the library is going to move to Headquarters Building. All artifacts in one location. The library and archives will jointly turn into the new Research Centre. With the renovation of Headquarters Building the circumstances and environmental conditioning of the museum will need to be upgraded, the current situation is not optimal. After paying a deposit, visitors can obtain an audio box where the stories of the different subjects are told in various languages, not only in the museum but also on the estate about the buildings and the persons who were important for the TS. This audio tour works with numbers, if you choose the number of the artifact, building or situation you see before you, you get the story. There will be a map of the museum and estate where one can easily find one’s way to the items of interest, on the estate signposts will be placed for the same reason. In this way it’ll be possible to make our history visible to the public and point to the role the TS still plays in the world. Since the audio tour is a self-guided tour not much personnel for the museum is needed; it is a low-cost undertaking.